We are HUGE pasta fans in our house. We typically eat at least one pasta dish a week and this is one of our favorites! Making this dish is a bit time consuming so I normally make double and freeze a batch for another meal. Don’t worry if someone doesn’t like ricotta or cottage cheese…blended in, it only adds flavor. My daughter Kinley doesn’t even notice. Enjoy! Bring a large pot of lightly salted water to a boil. 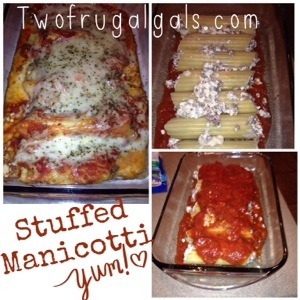 Add pasta and cool boil pasta to half the recommended time on the package- then place ice cold water over manicotti. Preheat oven to 350 degrees. In a large skillet brown beef on medium heat. Drain and cool. 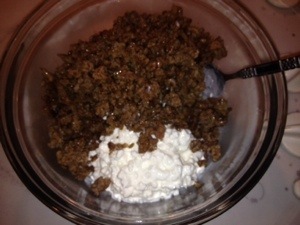 Combine beef or sausage, cottage cheese, 1 cup mozzarella cheese, Parmesan cheese, egg and oregano. Mix well. Stuff shells with mixture. 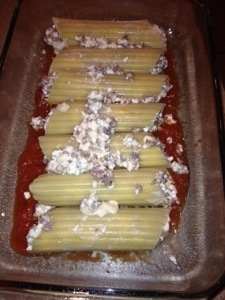 The key to stuffing the manicotti is by using a pastry bag or zip-lock bag (with corner cut). 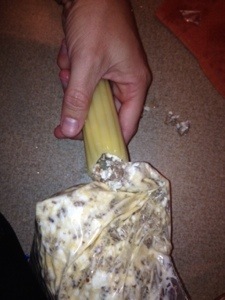 Or just hold the noodle in one hand and plug the end with your fingers and stuff it with the other. Lightly grease a 9×13 inch baking dish. Pour enough spaghetti sauce in dish to cover the bottom. 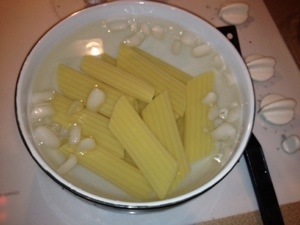 Place stuffed noodles in the dish. 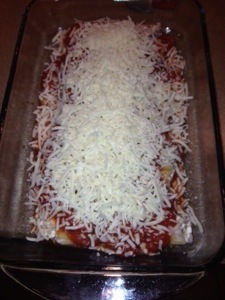 Cover with spaghetti sauce and top with the remaining 1 cup mozzarella cheese. Bake covered in preheated oven for 50 minutes. Enjoy!